This is where the cat show was being held. My human says she has been here, a couple of years before I was born. It doesn’t look that old to me! This is the Event Center, where the cat show was located. There are two big halls — there was some dog agility thing going on in the bigger hall, and the cat show was in the smaller hall (which was still pretty large!). 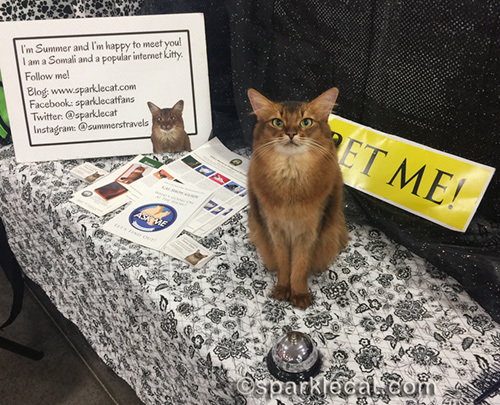 It turned out we had lots of room to spread out all my Pet Me Cat things — the brochures, my poster board… and my bell! Sometimes I rang it and sometimes I didn’t. I did do my other tricks… including this one! Okay, so maybe the tongue curl wasn’t a real trick, but it looks awesome, doesn’t it? 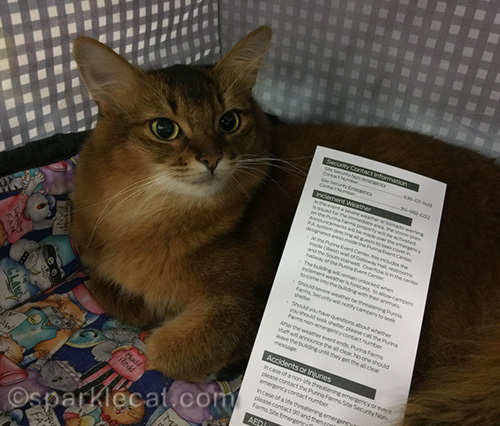 One thing made my human a little nervous: when we went through the entrance, they handed her these emergency procedures which, since this is the midwest, explained what to do in case of a tornado! My human is scared of tornados the same way, I guess, a lot of midwesterners are afraid of the earthquakes we have on the West Coast. Anyhow, I will give you a spoiler here: we didn’t have a tornado during our trip. There weren’t a lot of vendors at this show, but one had these really awesome fish beds! I would have liked one, but my human said there was no way it would fit in our suitcase. 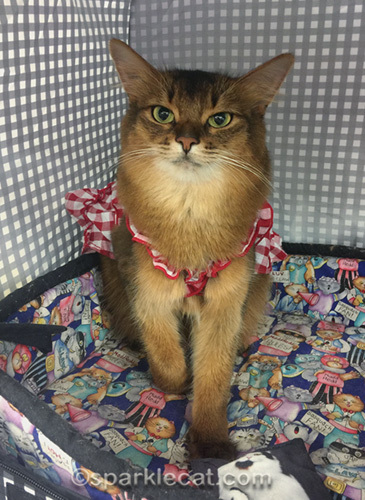 This gingham dress was one of my outfits — I thought it was nice for a midwestern cat show at a farm. 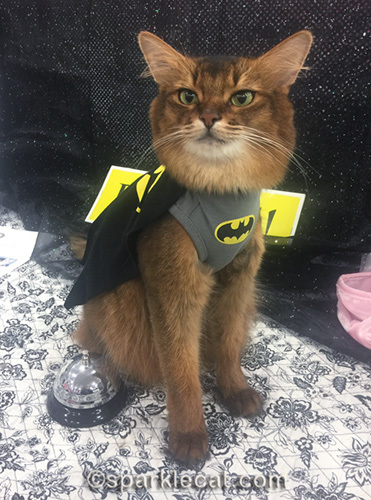 I almost didn’t get to wear my Batcat costume because my human accidentally set it on my water dish and it had to dry out! I wore my fancy dresses too, but she didn’t get any photos of me in those. Anyhow it wasn’t about the outfits, it was more about visiting with people, which I did a lot of! Many of them hadn’t seen a Somali cat for a long time. There aren’t many of them out here. 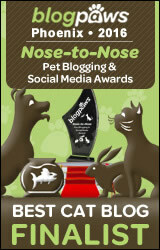 And I bet none of them had seen a Somali cat that did High Fives and shook paws until they met me! I’m glad my human brought me treats, because she didn’t eat anything I could share with her. 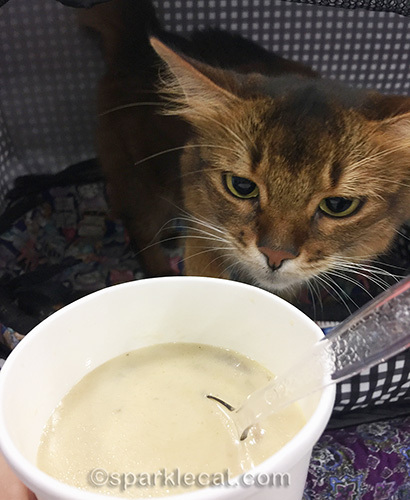 The menu in the cafe was mostly meat, and she didn’t like the couple of chicken choices, so all she had both days was a cup of smoked gouda and mushroom soup. She said it was good, but I didn’t get a taste. It was an exhausting two days! There were six rings for the competing cats each day, which meant the show days were extra long. Luckily, I wasn’t competing so I could leave a little early, but my human wanted to make sure everybody got to see me who wanted a visit. As you can imagine, my human was kind of hungry after the show was over. It turned out that a cat blogger lives nearby and she and my human went to dinner. I don’t know the cats from her blog, Parker, Maggie and Ken because they took a break from blogging right before I was born. Sparkle was good pals with them, though. Their human met me and brought me some cat toys, which was very nice of her! 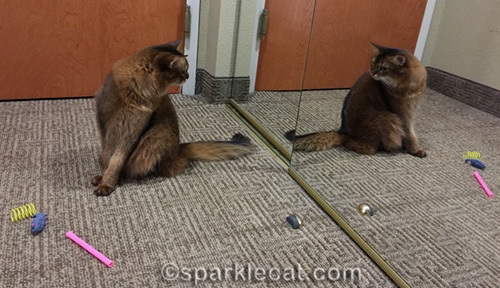 But then, when I came back to my hotel room, I realized she must have also brought some for the mirror kitty that lives here too. Those are FANTASTIC pictures! So many interesting ones–The tongue curl is spectacular, and your country-check dress is purrfect. Say, you should lose that Batman suit and get a WONDER WOMAN! The Human has seen that movie TWICE. It’s good you got a nap in too. I don’t know how I missed that you’d be in St Louis with your human, Summer! I live in St Louis!!! 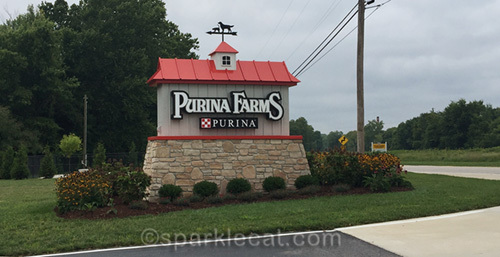 It’s been years since I was at Purina Farms … but maybe I can convince The Boy to go with me next weekend. My favorite was always the multi-level cat house (and second … the farm animals!). My human and I are so bummed that we didn’t realize you lived in St. Louis – we would have loved to have seen you. Mee-yowytou look so cute inn yur ging hammy dress summer! An thee sunglassess are kewl all so. Ladymum said to tell Lady Janiss shee has been inn an EFF 3 Tornado an it was wild an crazy an scarey an xhiliratin…. Mee finks mee will pass on THAT xperieince! You sure did have a busy time at that show! Good that you didn’t have to endure a tornado. This looks like another successful show Summer, even if you are not pawticipating in the competition. You look marvelous in your batcat suit. You were sort of close to me Summer. Just about 6 hours away by car. Looks like you had fun at the event, Summer. We woulda wanted one of those fish beds too. Summer, that sounds like a lot of fun. We’re glad there were no tornadoes! 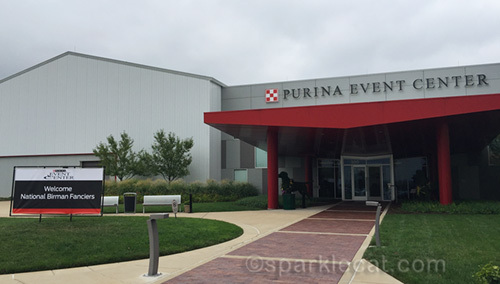 I’d love to visit Purina Farms one day. And you are such an adorable little country girl in that gingham dress! YEE-HAW! That sounds like a great show! And that mirror kitty seems to follow you everywhere. Summer, those fish beds are cute. 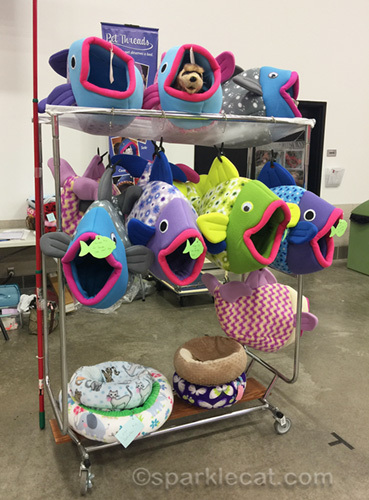 We’ve seen shark beds like them on IG but these fish are much cuter and more colorful. I wonder if any were sold. Your outfits and sunglasses are adorable. The lady loves the title of this post! I thought the tongue curl was an excellent trick. I can’t do that. You were dead-on right to bring your pretty gingham dress. That tornado info would surely be scary with our humans, too! Sounds like you had a good time! Summer, that gingham dress looks adorable on you! 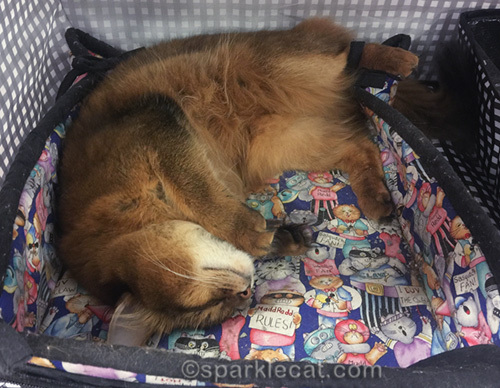 Tell your human, next time, that she doesn’t have to put your new beddy in her suitcase…they could ship it to your home! Then…and here’s the best part…not only do you get the new beddy, but you get a box too! WOOT! Summer I love your gingham print dress. Absolutely and the shades on your heard always crack me up. so happy you had a great time!! 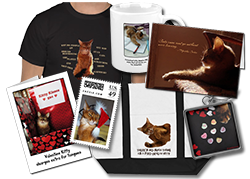 I remember the Kruse Cats, their name is quite familiar! we love hearing about you being out and about and educating people. TW is scared of tornadoes too and with climate change they are getting closer to us. I’m glad you can have fun no matter what you go. I’m also glad your and you human met up with our BFF Wanda. Too bad you didn’t meet my homey Maggie, Parker and Ken. I’ve been virtual “dating” Parker for years. Oh my goodness, that second picture makes me want to more than pet you! I want to pet your soft warm fur! I want to scratch you on the scalp and on the chin, and listen to your loud purr!! What a beautiful kitten you are!! Mom was very lucky to meet you Summer as well as your Human. We live about 30 mikes from Purina Farms. Anytime an anipal gets that close our ears perk up! Summer is every bit as engaging as her pictures. Her Human is equally fun. Mom said it is interesting learning about what other humans do. She wishes she was talented enough to write like Summer’s Human. All told, it was a great evening. This sounds like an awesome event and you’re slowly traveling out east. Maybe New York is next? Who makes those fish beds??? I know you had a great time pretty Summer and I’m sure everyone was thrilled to see you! i’m a Midwesterner that is afraid of tornadoes and earthquakes. Here in St Louis, we have both. Actually tremors, but the New Madrid Fault runs nearby and is waiting to happen. Summer! Smoochie! Love the fish beds you showed us and the farmers daughter outfit. Suited you to a T! Glad you had a good time on your trip Summer and met lots of people. Those fish beds are kind of neat but I bet we wouldn’t get in them. Have a good day. We luff that tongue curl. Really advanced technique. And our mom… doesn’t want tornados OR earthquakes! You have such cute outfits Summer. I don’t have any! My mum says she likes me just the way I am. All long furry like but I think she is a bit mingy. You are so lucky to have a bell. I will ask for one ar Christmas. Glad you have a roommate that looks just like you. Get a good nights sleep ready for your next busy day. By the way your humans food sounded rather nasty. Poor her. Tornardos! Now that’s something too be afraid of – our silly human is afraid of spiders, although there’s no toxic spiders in Finland. We really love the BatCat outfit, Summer/ You look so cute in it. It does look like a very busy weekend for you. You’re such a star! Glad you had a great time. We love the fish beds too!